In the wake of the massacre in Christchurch, New Zealand, the Society has decided to publish the Khutbah (sermon) delivered at the Canberra Mosque by Imam Mohammed Swaiti on 22 March 2019. No registration is necessary and the classes may be joined at any time. For further details, please contact any member of the Executive Committee (see Contact Us page). Authorised and organised by the Islamic Society of Australian Capital Territory (ISACT). See prayer timetables on the right on the page for times and other details. Jama’ah to be led by appointed imams/brothers only. Jama’ah times endorsed by Islamic Society of ACT (ISACT). Please contact any of the Society Executive Committee members if you can assist in any way. 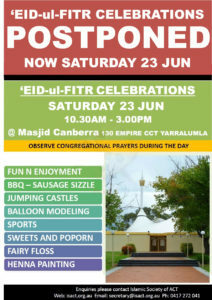 The’ Eid day will be either Friday (15 June) or Saturday (16 June), subject to the announcement by the Imams Council of ACT. Irrespective of the day, the ‘Eid Salaah at Masjid Canberra will inShaaAllaah start at 8:00am SHARP. If you wish to attend the ‘Eid Salaah here at Masjid Canberra, plan to be here at 7:30am to ensure you do not miss the start of the Salaah. The Islamic Society of Belconnen (Spence Mussallah) are organising the’ Eid Salaah at Exhibition Park in Canberra (EPIC), located in Mitchell Their Salaah is planned for a 8:30am start. Further details can be found on their website: http://isb.org.au. On behalf of the Imams Council of ACT, Imam Adama Konda has announced that since the Day of Arafah will fall on Monday, 20 August 2018, Eid-ul-Adha will Inshallah be on TUESDAY, 21 August 2018. Are you performing Hajj this Year ?!? Do you want to know more about Hajj ?!? Do you have questions or concerns ?!? The orignal prayer timetable for Ramadan 1439AH was based on the month starting Wednesday, 16 May 2018. With the announcement of the start of Ramadan being Thursday, 17 May 2018, the dates on the original timetable are out by one day. If you wish to obtain a corrected copy of the prayer timetable you can download it from this website as it has been updated. If you continue to use existing printed copies of the prayer timetable, please beware that they will all be out by one day. The Imams Council of ACT (Imam Mohammed Swaiti, Imam Nourredine Laraibi and Imam Adama Konda) have met after Maghrib today at the Canberra Masjid and have declared that fasting for Ramadan 1439 AH will start on Thursday, 17 May 2018, Inshallah. Therefore, Taraweeh prayers will start WEDNESDAY straight after ‘Isha’ at 7:15pm. If you are interested in hosting an iftaar during Ramadan at the Canberra Masjid for the brothers & sisters attending the masjid, please contact Br Abdul Hakim or Br Khalid Yamin to ensure there are no clashes.